The truth is that, while there were some revisions to the U.S. policy on travel to Cuba in late 2017, we Americans can easily travel there and the best way is by cruise. The aforementioned ‘restrictions’ primarily relate to restricted hotel stays, meaning some are indeed not permitted by our government for Americans to stay as guests there. However, when visiting by cruise ship, this is obviously not an issue. There’s also the added benefit that Cuba cruises to Havana dock directly in the heart of town and you can easily walk to many great local sights. Cuba offers the most diverse cultural experience of any of the Caribbean islands; the architecture, the food, the people, the history – it’s all fascinating! are free to approve, or simply venture elsewhere. Moving along, there are other great options such as Fat Cat’s for jazz & blues, Headliners for comedy, disco in Bliss, or a great outdoor option at Spice H2O for the cool set (or those who want to at least try to feel ‘cool’). Of course there is the usual cruise ship inclusions of the casino and a host of great bars, too. being The Haven. This is an Norwegian trademark and functions as a cruise within a cruise. The Haven are suites and deluxe cabins in their own private access area, located forward on the top of the ship. Here you’ll find your own private pool area, private lounge area, private dining room, and private deck all for Haven guests only. It has great snob appeal and is honestly a great appeal to non-snobs, too! Their concept is to cater to those who would want a deluxe more intimate experience (think Seabourn, or Silversea), but would appreciate the amenities of a large ship, such as multiple entertainment options and facilities for kids (The Haven is perfect for grandparents bringing on the whole family for an inter generational cruise experience). 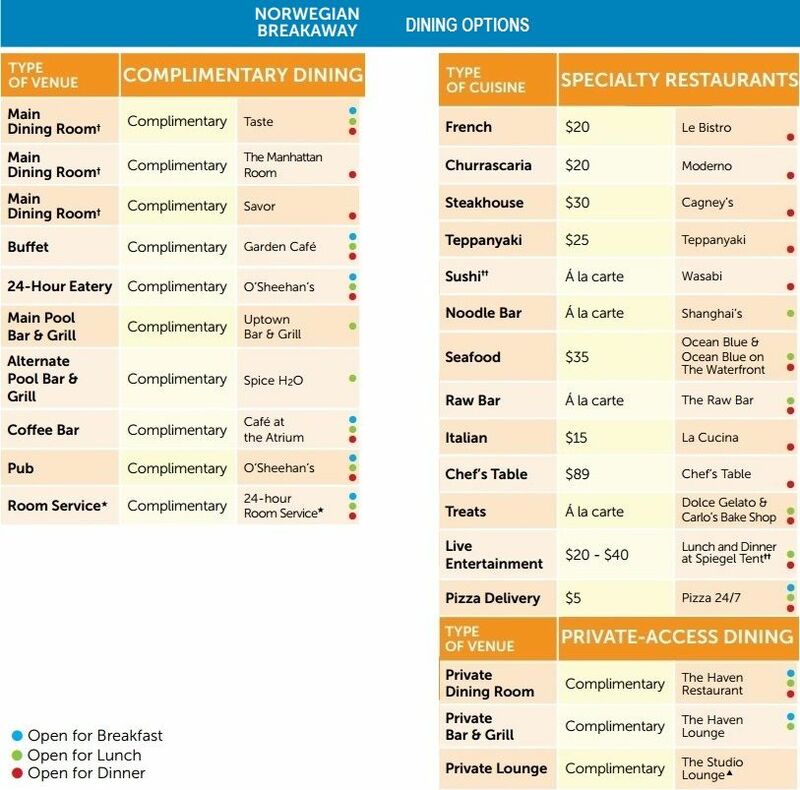 Another Norwegian exclusive for accommodations is the Studio. Here they have built a good number of single occupancy cabins for solo travelers who don’t want to pay the usual high single supplement in a standard cabin. These cabins are cozy, but very well designed and even have their own lounge area where you can mix & mingle if you so desire. This makes such good sense and I think they’ve done very well so far (this is the second Norwegian ship with Studio cabins). So enough factoids. Did I like the ship? Yes! 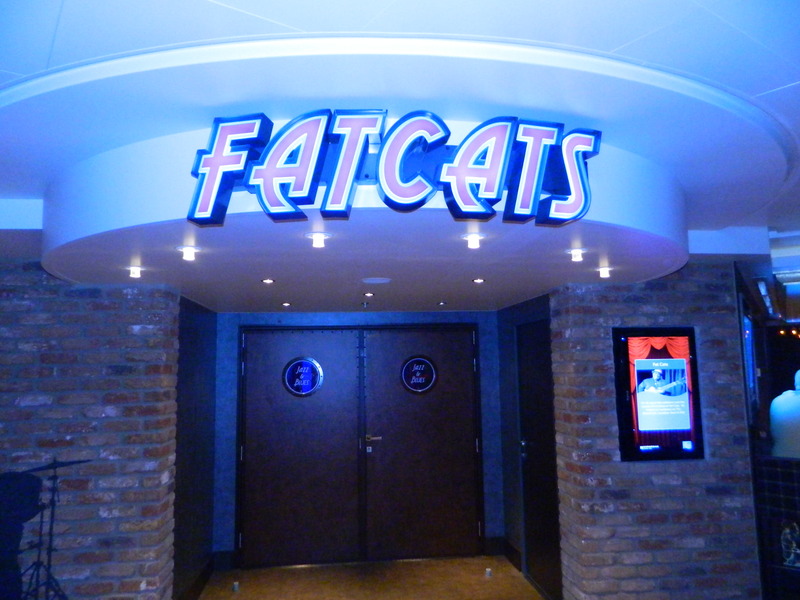 Norwegian Breakaway has great facilities and really seems to ‘flow’ well to me. It’s very large, but does not really ‘feel’ all that large. Most areas have a very open design and this seems to bring it all together, rather than being chopped up into multiple locations as on some ships. 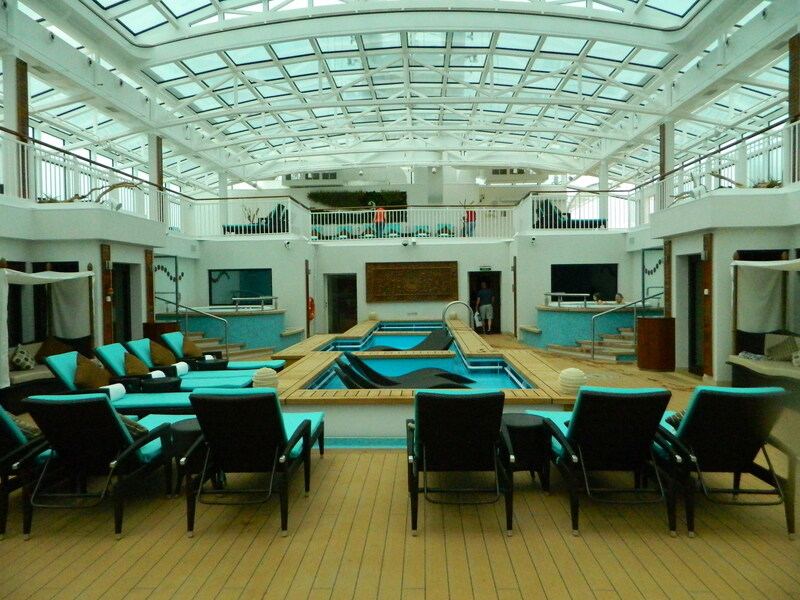 Most of the décor is quite pleasant and not ‘in your face’ like you may find elsewhere on other ships. The only ‘over the top’ feature is the huge waterpark and ropes course on the back of the top deck, but then that’s just another example of having something for everyone! Overall, I found it all much more appealing than my last Norwegian experience a few years ago. They have different management now and have honestly been trying to upgrade their product and make improvements the last few years and it shows. This is good for us to see as we’ll have a Norwegian ship sailing from Houston starting next year. While it won’t be a brand new one like the Breakaway, it will have the Norwegian Freestyle trademarks and facilities so we’ll look forward to this new option for our Texas clients! In the meantime, the Norwegian Breakaway is sailing from New York to Bermuda this summer and will offer itineraries to the Bahamas & Florida from New York in the winter. In early 2014, she’ll be joined by a twin sister, Norwegian Getaway, which will be based in Miami for year-round sailings to the Eastern Caribbean. New Ship Review – Almost Here! It’s always exciting to see a new cruise ship! Most cruise lines host a travel agent ‘preview cruise’, or cruise to nowhere to showcase their new vessel. 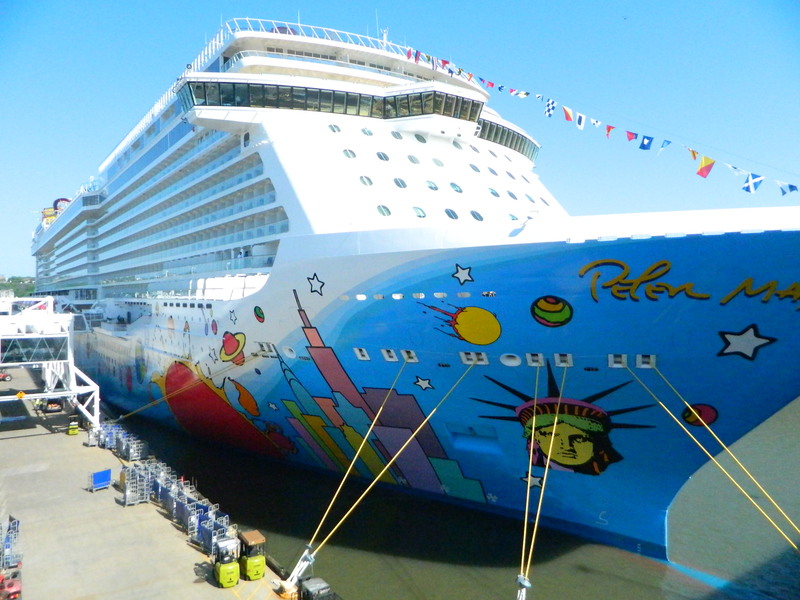 Such is the case this week in New York with Norwegian Cruise Line’s new Norwegian Breakaway. I’ll be fortunate enough to participate in tomorrow’s cruise, which will return on Sunday. With all the tools of technology available today, the cruise line created a cell phone app just for our departure, loaded with all kinds of ship info, deck plans, onboard events, and a host of info to boost our excitement (and I have to admit the excitement angle has worked! ).